I always claimed if I was ever inclined to stop reading comics, it would not include Dave Sim’s Cerebus. I would never quit reading the beloved aardvark. I was sold from issue #26. Decades later with the release of the final issue #300 I knew my tether to comics was broken were I to ever be inclined to stop reading. More profoundly, it meant the semi-regular fix of Dave Sim work was ended with no real details on what might be next. If anything were to even be next. Late 2007 word came Sim had 2 projects in queue. There’d been a few previous works post-Cerebus, and Win-Mill Productions’ “Following Cerebus” magazine, but nothing entirely, purely Sim. So “Secret Project One” and “Secret Project Two” (Glamourpuss) were welcome announcements. Sim is producing photo-realism work (with Judenhass and also with Glamourpuss). Photo-realism is when artists render subjects with sharp, photographic precision, often using photoreference as basis. Finished works of art look as if they are a photo, even though several photos may have been combined to complete the work of art. Al Williamson and Alex Raymond are among the masters (and looking at some of the Star Wars comic-covers from the 70s and 80s you can see some of the reference). Judenhass is an achievement in thought and in art, although the production seemed more obvious on some of the layouts/pages. Sim appeared to be trying to have repetition of the image reinforce theme or message, but in some instances this was a bit too obvious in execution. Despite this (small) criticism about the production, Judenhass is well researched and contains many revelations about history which many people may not realize. Sim provides research notes in the back. These notes are condensed enough to be a quick read, although I found them condensed too much since as I was interested in the research journey Sim embarked for the book. Midway through reading Judenhass I thought wouldn't it be interesting to create a similar 64 page book for different religions or cultures. Something of a library of hate (although this was not the intent of Judenhass and I cringe at this titling concept). Some of the quotes in history were surprising (TS Eliot, Martin Luthor, Jonathan Swift among others), and I thought it might interesting to have similar efforts commenting on Christianity, Mormonism, Buddhism, and so on. Ultimately Sim's work got me thinking, questioning and wanting to know more about more. If a 64 page comicbook can inspire someone to want to explore something thought informed well-enough with, then it’s a comic worthy of wide-circulation and acclaim. 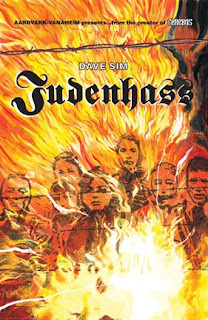 Judenhass deserves similar recognition to the comics art-form as Art Spiegelman's Maus, Gene Luen Yang's Chinese Born American, or Chris Ware's ACME Novelty Library among many other notable, seminal works. Judenhass is $4.00. 64 pages. Highly recommended. Grade of A.
I read High Society a couple years back and enjoyed it quite a bit. I really need to get around to picking up the next volume of Cerebus. Someday, someday. I'm always wary of Dave Sim because of, well, who Dave Sim is. He scares me. I've had fortune to meet Dave (he comes across as Dave rather than Mr. Sim) a few times, most recently a few years back in NYC. He's cordial and extraordinarily nice. At the NYC thing (organized via the Cerebus Yahoo Group), there were 3 others who showed up. We decided to wander to the diner next to the hotel. One of the group didn't have the cash on him, so Dave loaned him the $20 so he could he wouldn't need to just sit there while everyone else at and drank. High Society remains one of my favorite works of all time. Most of first 25 issues of Cerebus were storytelling with satire. With High Society, Dave stepped soundly into role as author and composer. Ultimately I believe Cerebus should be considered as accomplished as any of the works of Safire, Amis, Mailer, Pynchon, Wolfe, and Chabin. The final half is unlike anything produced in the comic medium -- more literature than graphic novel.